Of the technological innovations transforming manufacturing, additive manufacturing may be the most discussed. Publications from technical industry magazines to Harvard Business Review have discussed its potential, and called out its hype. The Great Lakes TAAC is hearing more about additive manufacturing from our firms, and it’s a technology whose impact more small manufacturers should consider. Additive manufacturing (AM) has been in use for over 25 years and is known by many as 3D printing, a term that is essentially synonymous. Stereolithography equipment would chug out small prototypes at design firms. With advances in computing power, more specialty materials, and the expiration of patents, the technology has come down in cost. This has spawned a home hobbyist market, which drives much of the media attention. But the real potential still remains in design and manufacturing. Earlier this summer, fellow GLTAAC project manager, John Antos, and I paid a quick visit to the 3D printing lab on the engineering campus at the University of Michigan, five minutes from our office. 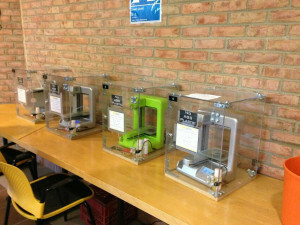 Basic 3D printing is so accessible that a set of four small printers, capable of producing small pieces, can be checked out by students after watching a brief online tutorial. The machines are part of the library. That’s a long way from industrial scale operations, but it shows how ubiquitous the machines have become. Larger machines are also available for more sophisticated work. Parts from class projects or graduate level designs keep the machines running constantly. Many projects are in collaboration with a medical specialty, where a custom piece for a patient is explored. A staff is available to schedule machine time and help engineers or student teams tackle more comlex needs. AM encompasses many processes where a part is made by building up material layer by layer. Early processes included stereolithography, where melted resin would cure with directed UV laser light. Other techniques, such as extrusion and sintering, have been applied in additive fashion, using a digital 3D file and machine guided application of material to each layer. Most industrial use thus far has been with plastics, though industrial scale machines can also work with metal alloys, melting a metal powder as layers are built up. Since material is built up, the machine does not require tooling, saving significant up front cost. Design iterations can be run economically, creating great flexibility for designers testing out ideas. Additionally, the process does not create nearly as much scrap as traditional manufacturing methods. However, these savings are offset by much higher material cost and slower processing speeds. The machine itself is also a significant up front cost. Researchers have evaluated the economics of AM versus injection molding and other processes. Hard and fast rules are not clear as geometry, volume and other factors affect each job. Though large volume jobs are clearly more economical with traditional methods. Engineers also need to consider whether parts built layer-by-layer will have the same durability as parts created by injection molding or casting. Of added significance is AM’s ability to produce parts with geometries not possible with traditional manufacturing. Components that may have required assembly might now be printed as one piece, saving costs in assembly or welding. How should small manufacturers approach AM? The equipment is a significant investment. And, regardless of AM’s impressive capabilities, most experts in the field don’t expect to see AM replacing injection molding or casting in much of manufacturing. It seems to be viewed as an evolving strategic tool, a mainstay of product development, and a potential production option for short runs and highly customized jobs. Regardless, a 2014 Gartner report estimated that worldwide end-user spending on 3D printers would jump from $1.6 billion to $13.4 billion from 2015 to 2018. When is the last time a machine realized that kind of growth? To consider the impact of AM on your business, the following questions are worth considering. Do your customers expect assistance with prototyping or design for better manufacturability? When pursuing new business with customers, is your firm a resource regarding manufacturability as a project moves forward? How important is it for your business to be involved at the early prototyping stage of a project to land the eventual job? Do you have the know-how to help a customer determine which production approach is most economical? Can you help a customer launch at low volumes, then transition to higher volumes, offering cost effective approaches at each step? Do you have the design and engineering capabilities to attend to all these needs? How many ideas have you considered testing, but product development was just too expensive? How quickly can you test out a new idea in the market? Will AM-specific materials meet needed structural requirements? Do you have multidisciplinary team members who are trained in this technology? Are you able to accept electronic files from your customers? Can you convert a CAD file to a file capable of guiding the three dimensional work of 3D printers? Would offering this service set you apart from competitors? To test the waters with AM, it may not be necessary to invest in a printer. There are many established 3D printing service bureaus that will accept designs and deliver parts. 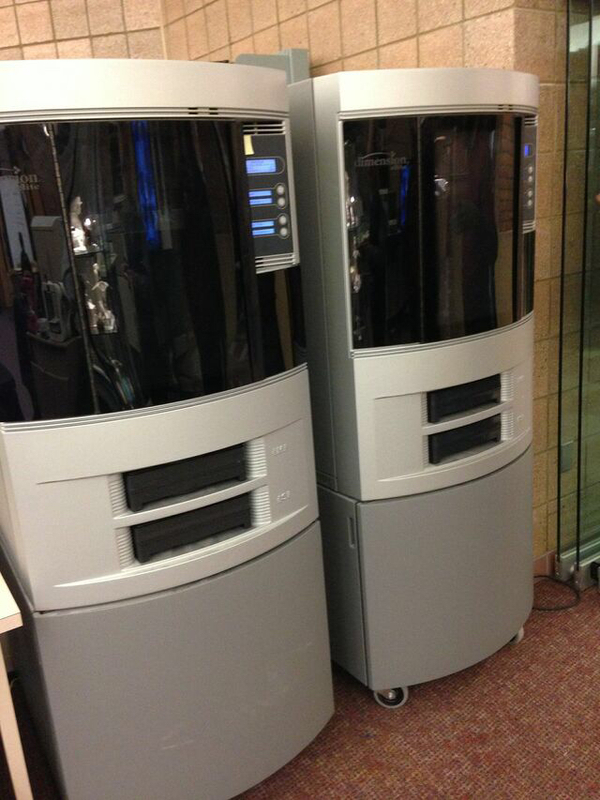 Even UPS has ventured into 3D printing, offering printing services at its stores. UPS even targets manufacturers needing jigs and fixtures, recognizing these pieces as short run and time sensitive, ideal for AM. A readiness to field AM needs with a well-versed partner can help bolster a firm’s overall value to its customers. In the near-term, AM may find its way into more shops via hybrid machines that offer traditional machining processes alongside an AM tool. Parts could be cut and shaped in one stage with a metal or plastic layer added via a specialized tool. But AM technology continues to develop in ways that may surprise. Google Ventures recently invested $100 million in Carbon 3D, a company that has developed technology (via research at the University of North Carolina) that builds up parts from a liquid bath at rates much faster than existing AM. The process, called Continuous Liquid Interface Production, forms the part out of a liquid using photochemistry techniques. The company claims its technology can “print” in minutes plastic pieces that take hours via traditional 3D printing. It also eliminates layers, potentially producing parts with properties similar to injection molded pieces. Better, faster and, possibly, cheaper options may be on the horizon. Learning to work with AM, either in house or with a partner, will be a worthwhile investment.